When you picture your wedding day, what do you see? White twinkling lights in a brewery courtyard? Breathtaking mountain views in the background? An intimate elopement at an historic B&B? Something totally off-beat? Whatever your wedding dream, you can make it a reality in the artistic, eclectic, and up-for-anything city of Asheville. Our restaurateurs, venues, and makers welcome a creative vision that they can help execute in a big or small way. Discover which of these seven concepts matches your Asheville wedding personality, then have fun customizing your wedding style to make your special day uniquely represent your love. Looking for a wedding fit for royalty? Consider getting married on the grounds of the 8,000-acre world-famous Biltmore, America’s Largest Home™. Other regal options include, Homewood located in the historic Montford neighborhood, with a stone exterior that ensures stunning pictures. The Crest Center & Pavilion’s spectacular 360-degree view of the Blue Ridge Mountains won’t disappoint. Or opt to say “I do” at two Old-World hotels that have welcomed presidents and other prestigious guests–The Omni Grove Park Inn or the Grand Bohemian Hotel. If you have a particular natural scenery in mind, Asheville can deliver. Sprawling farms offer on-site lodging, mountain views, and even a private island at Olivette. Check out 500-acre Claxton Farm or 17-acre Hidden River for a private evening with panoramic views,. Add a touch of adventure to your bachelor/bachelorette parties with nearby whitewater rafting, ziplining, or paddleboarding near the French Broad River. A recent Asheville bride gushed, “The outdoor activities are limitless in that part of the world.” You can even pick your own flowers at Lady Luck Flower Farm or work with the florists and decorators at Flora or East West Vintage Rentals to nail that natural vibe. 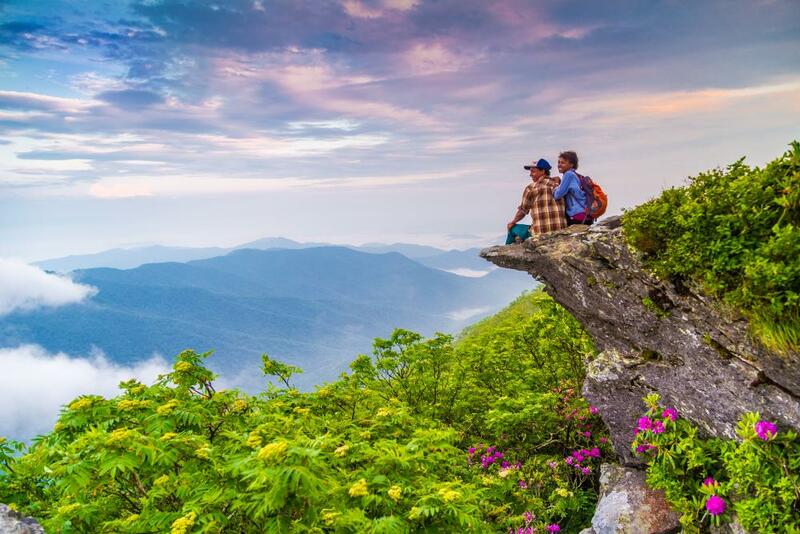 The Blue Ridge Mountains have inspired countless songs, books, and films, so why not have this majestic mountain range inspire your wedding? Secure your wedding permit for nuptials along the Blue Ridge Parkway or have a wedding shoot along “America’s Favorite Drive” before or after your elopement at the Asheville Botanical Gardens. Many bed & breakfasts also provide lovely options for intimate weddings, such as Bunn House, Cedar Crest Inn, and At Cumberland Falls B&B. If you’re seeking an urban, modern, or non-traditional wedding, many downtown breweries and music venues provide an ideal setting. Book world-famous music venue Orange Peel for your reception and add in a bar crawl after-party. 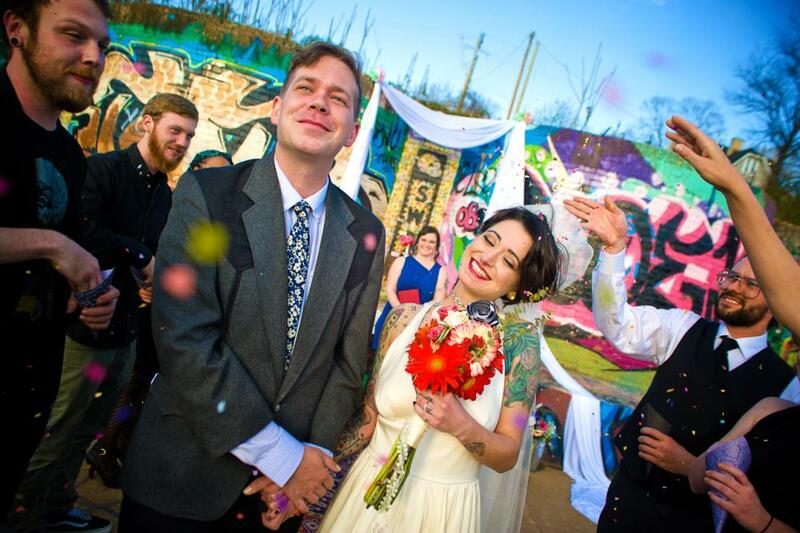 Incorporate a bit of Asheville’s River Arts District with wedding portraits from an array of talented photographers, and use the warehouse-turned-art district as the backdrop (including a few graffitied exteriors). A wedding at riverside Salvage Station with indoor and outdoor stages and multiple bars will also help you rock an indie aesthetic, or team up with Asheville’s newest wedding chapels, Fleetwood’s Chapel (they promise it will be “cool, not lovely”) or Haiku I Do, which specializes in pop up weddings wherever, whenever. 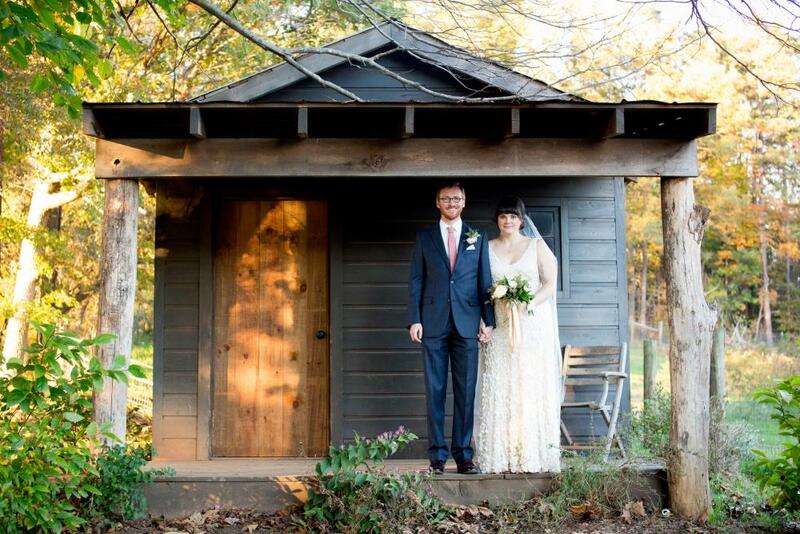 If you’re planning a wedding in Asheville, it will likely be homegrown, local, and sustainable in some way because these practices form the fabric of our community. Want to go really green? Opt for the NC Arboretum, a 434-acre public garden that decrees, “Couples will follow green initiative guidelines for their wedding and pledge to practice environmentally conscious planning, food/beverage service and décor in order to minimize the environmental impact accumulated during the special event.” Saffron Fine Foods catering also have a green/local commitment and will work with you to incorporate your family heritage, seasonal items or even your color scheme. And with the nickname Beer City, kegs from one of our 30+ craft breweries are a must. Tasty edible gifts from French Broad Chocolates or Chocolate Fetish are sure to be a hit, or shop from at Kress Emporium, which features 80 regional artists selling unique creations. Envisioning BBQ, a barn, and a farm setting for your soiree? The Farm, Barn at Honeysuckle Hill, or Yesterday Spaces will fulfill your rustic wedding vision, and they pride themselves on working closely with couples to provide anything but a cookie-cutter event. Another intimate option? Starting in July 2017, June Bug Resort will host weddings at their Weaverville farm, which features 10 vintage trailers that can accommodate up to 32 people, making it the perfect setting for a retro-inspired wedding. We also take our barbecue seriously in North Carolina, so contact Luella’s Bar-B-Que for meat and traditional sides, or opt for The Smoker Package: a smoker, pig, and pit master will cook up vittles on the spot, or add a live brisket slicing station to your catering package. Your special day calls for a bit of the spotlight. Consider booking your bachelor/bachelorette party on Asheville’s pubcycle or a LaZoom comedy/brewery tour for a jaunt through town where your group will be sure to turn heads. Dance Club Asheville offers bachelorette packages and specializes in pole, burlesque, and flashmob dancing so you’re ready for the limelight at your wedding. For your inner rock star, a wedding at Isis Music Hall may best fit the bill, or go for over-the-top elegance plucked from history books at Asheville Masonic Temple with its cool historic theater backdrops. 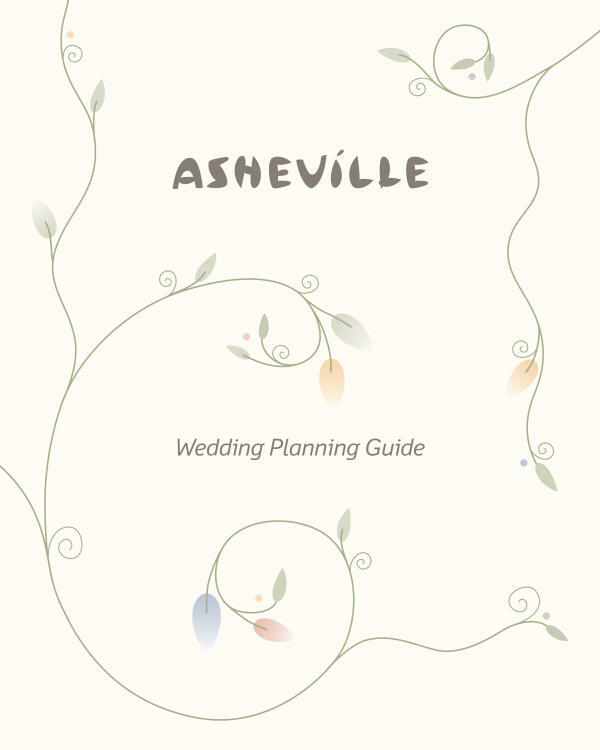 Now that you know your Asheville wedding personality, check out the Explore Asheville wedding vendor and venue listings. Our team also offers complimentary assistance finding hotel accommodations for your guests—just fill out our wedding hotel request form and email it to weddings@ExploreAsheville.com. Shawndra Russell has called Asheville home for three years after living in and writing about Savannah, Georgia for ten years. 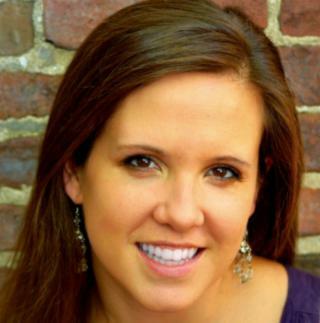 She contributed to Visit North Carolina’s official 2017 and 2018 travel guides and regularly writes for VisitNC.com, Capital at Play, Explore Asheville, and Craftbeer.com.